Andy Guptill, a promising young rider on the Colavita-Sutter Home team, finished in 84th position and in the Lanterne Rouge slot for the 2009 Amgen Tour of California. Guptill is a resident of Hannacroix, New York and in his third year on the team. He was named the Most Aggressive Rider for stage 2 of the 2008 Tour of Missouri. 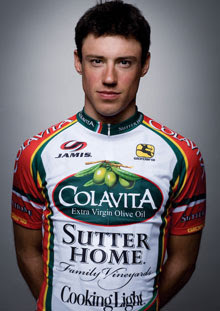 Notable penultimate finisher of the 2009 Tour of California was Tyler Hamilton, Olympic gold medalist, riding for Rock Racing. Correction: I had previously posted based on erroneous early reports that the Lanterne Rouge was Guptill's 28-year-old teammate Anthony Colby, a climbing specialist (and Durango, Colorado resident) who finished in 15th place at the 2007 Tour of Georgia. He wasn't even on the 2009 TOC start list. My apologies. 136 riders finished the TOC prologue, so Guptill finished ahead of 38% of the original field.